Eryn, my wife, and me having lunch at Dominick's a few weeks ago, adjacent to the Trestle Stop in sort of southeastern Eagan. I took this photo for the architect on our team because it was such a dead day at the office and I wanted him to see lunch in Eagan when it's good, rather than when it's depressing in the corporate cafeteria. 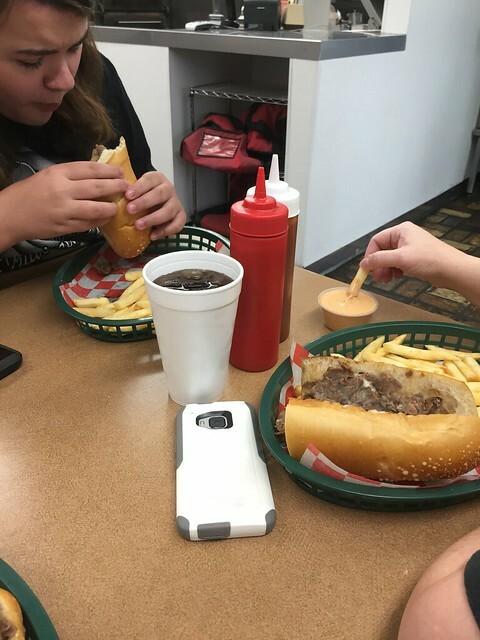 I also highlight it because they're both having a cheesesteak sandwich. Which is what I had. Which is what everyone who goes to Dominick's should have, particularly if it's their first time there. It's got to be one of my favorite meals in Eagan. Fresh bread. Lots of very hot fries. I think I might prefer it to Chipotle, although it's definitely worse for me from a calorie profile. Don't go Monday, they're closed!